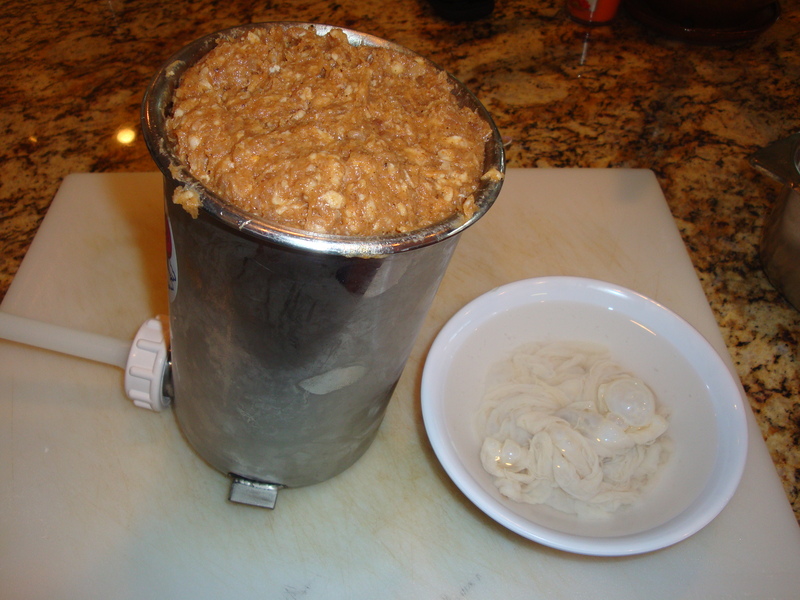 The holidays are upon us and as such it ‘Tis the season to make sausage, which is one of my favorite things to do. Call me crazy but I get a ridiculous amount of satisfaction from grinding and seasoning ordinary meat such as pork or beef and transforming it into a succulently stuffed masterpiece of man food. This will be the first sausage post I have done on the Pickled Pig which makes it that much more exciting. 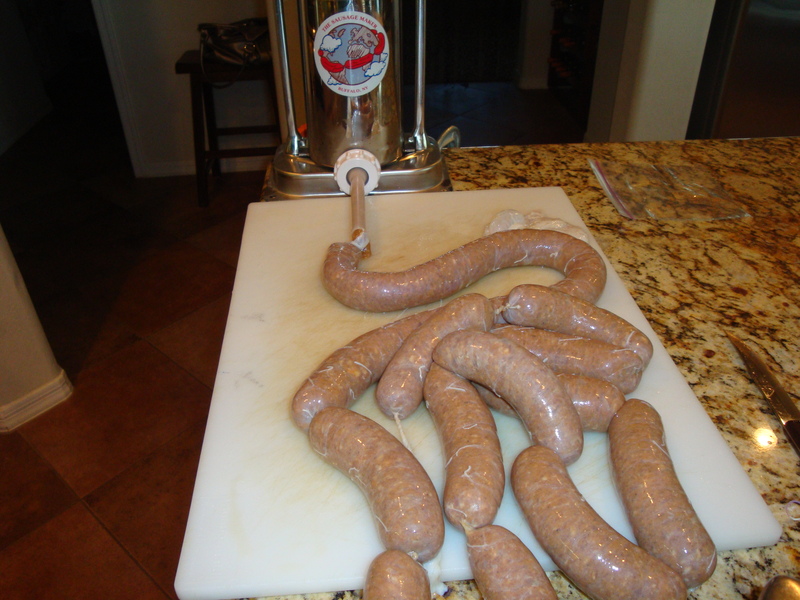 I have been making sausage for several years now and have learned oh so many lessons on what to do and not to do. One of the most painful lessons is to NOT make 15 pounds of sausage before you have tried and tested a recipe and method…what a waste! Go with a 5 pound batch at most. My hope is that I can pass on many of these lessons to you so that you do not have to make the difficult decision of tossing a bum batch of tube steak. The sausage I am posting today was actually made a few days before Thanksgiving as part of an attempt to produce a twist on an authentic Alsatian dish called Choucroute Garnie. Traditional Choucroute Garnie often consists of sauerkraut, sausages, other salted meats and potatoes. The recipe I tested was again from my favorite magazine Saveur and turned out great. The twist was that it replaced the typical salted meats with a turkey draped in a blanket of bacon on a bed of sauerkraut and onions (follow up post coming soon). This was a perfect opportunity to make two of the recipes from the Charcuterie cookbook. The first is sauerkraut from the Salt chapter that I have been chipping away at and the other is knackwurst. The first thing that I always do is cube my meats up so that I can stick them in the freezer for a bit while I gather and mix my spices. 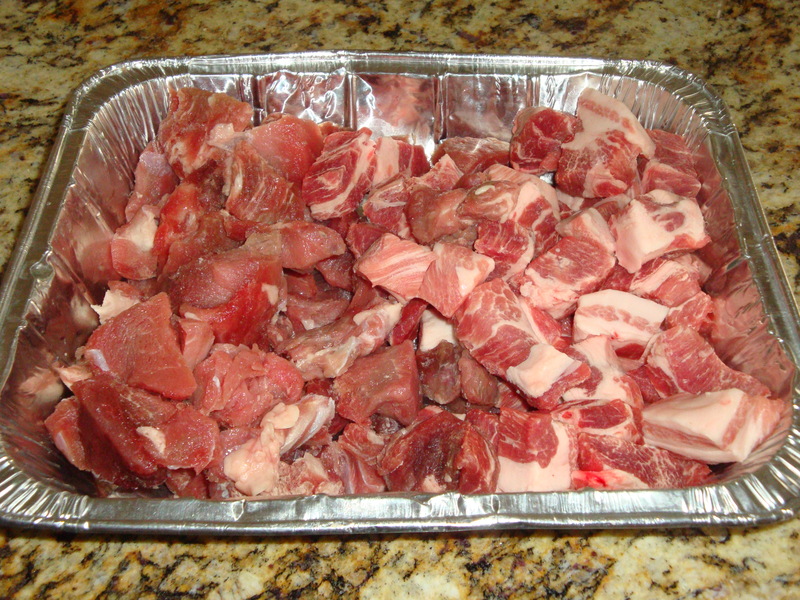 If I can stress one thing to you more than any other detail it is to make sure your meat is extremely cold. I like mine to be slightly crunchy however not completely frozen either…somewhere in the middle is just right. If you grind your meat while it is warm it will often smear across the plate and cause the meat and fat to separate giving you tasty meat with a texture of pencil shavings…needless to say, not good! I even like to put my grinder blade and plate in the freezer while refrigerating the grinder and auger. I have found that putting the grinder in the freezer can result in the plastic cracking. I have two small cracks to show for it. My point is that you cannot devote enough attention to the temperature of the meat and equipment. As such I often grind into an aluminum pan that is sitting in a small amount of crushed ice and water to keep the ground meat cold while I finish the process. After I have assembled the necessary spices and put my cup of ice water in the freezer to chill I begin the grinding process. As instructed I used the smaller of the two grinder plates and proceeded to grind the cubed veal and pork shoulders into the aluminum pan. Once finished I took the aluminum pan and again returned it to the freezer while I broke down my grinder for cleaning. I also took this opportunity to refrigerate the stainless mixing bowl that I will use to merry the spices and meat. I think you are beginning to see how obsessed I am with keeping everything as cold as possible. Toss five pounds of pencil shaving sausage once and you too will understand my attention to temperature. I ground my allspice, black pepper and coriander so that it is fresh and imparts its entire flavor to the sausage. Don’t use pre-ground spices that have been sitting in your cupboard for the past five years…it just won’t be the same. After I have weighed all my spices out I remove the chilled stainless mixing bowl from the freezer and add my slightly crunchy ground veal and pork shoulder to it. I turn my mixer on low using the paddle attachment and begin adding my spices and then the ice cold water so that it all binds and mixes thoroughly. Once well incorporated I kick the mixer up another notch and allow it to blend until it forms what looks like a sticky paste. I totally forgot to photograph this step however, it is pretty straight forward. I do want to endorse the idea of adding the nonfat powdered milk to the sausage mixture. Initially I thought this was weird and would give the sausage a milky flavor which didn’t sound too exciting to me. After research I found that this product aids in helping bind the sausage while enabling the mix to retain its moisture during the smoking and cooking process. This stuff worked awesome and I strongly suggest you’re considering it. Once fully mixed I used a rubber spatula to remove the soon-to-be-sausage into an aluminum pan and cover tightly with plastic wrap pressing firmly to remove as much of the air that may be trapped inside. I then put the pan into the refrigerator for about 24 hours to allow the spices to work their magic and permeate the entire meat mixture. As mentioned this fresh sausage is smoked and as such we are using pink salt which is important to prevent botulism from rearing its ugly head. 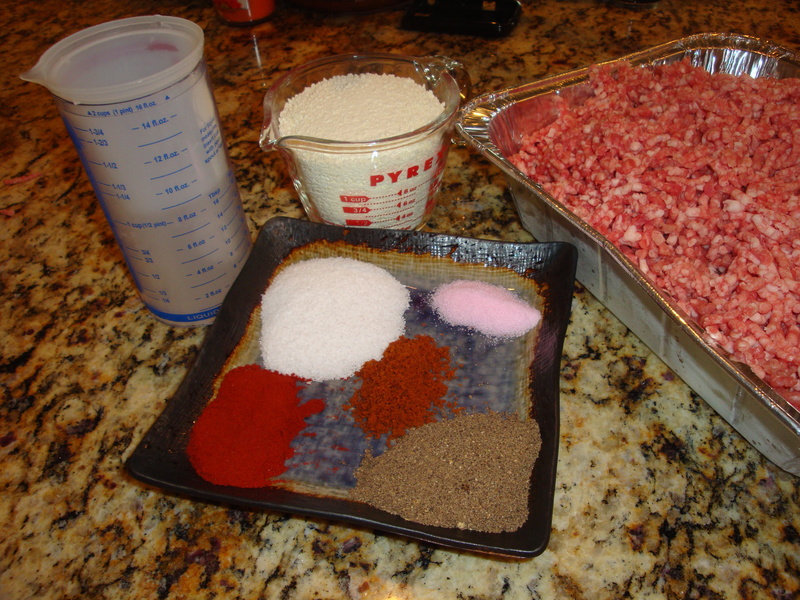 The pink salt will give the sausage a nice pinkish color similar to what you would expect from a cured ham. The 24 hour rest allows the curing process to run its course. The next day I put my 5 pound The Sausage Maker sausage stuffer in the freezer so that it can get chilled. Then I took about 10 feet of el-natural hog casings, nothing but the real deal here, and began soaking them in tepid water. I have a perfect little reverse osmosis water dispenser that I slip the casing onto and turn the water on. This does a great job of thoroughly rinsing any of the salt solution the casings are stored in. Once finished I remove the sausage stuffer and transferred the pan of sausage into it. 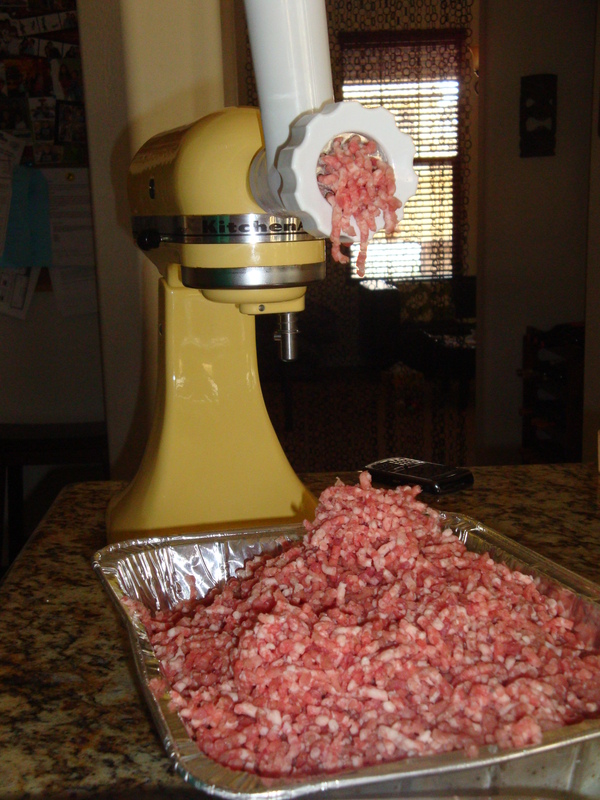 I then assembled it and loaded up my hog casings to begin the sausage stuffing process. The key to stuffing is a nice steady flow of sausage which you can stuff evenly by applying pressure to the casing as you allow it to slide off the nozzle. I tend to do this on my granite counter top and actually make it a little wet so that I can coil the sausage during the stuffing process. Once finished, I begin the process of linking the rope. My technique is to tie a knot on the end and begin measuring out the desired length and then pinching the sausage rope. Next I roll the link away from me and then move down to the next pinch and roll in the opposite direction. Each time I rotate the process of pinching and rolling a few times away and then towards me as I produce each sausage link. After the sausages are linked I dry them off with a paper towel and use a sterilized needle to prick the sausages in an effort to remove any air bubbles that were trapped inside the casing. After that I return the linked sausages to the refrigerator while I ready my Bradley Smoker. I set the smoker to 180 degrees and allow it to get up to temperature. 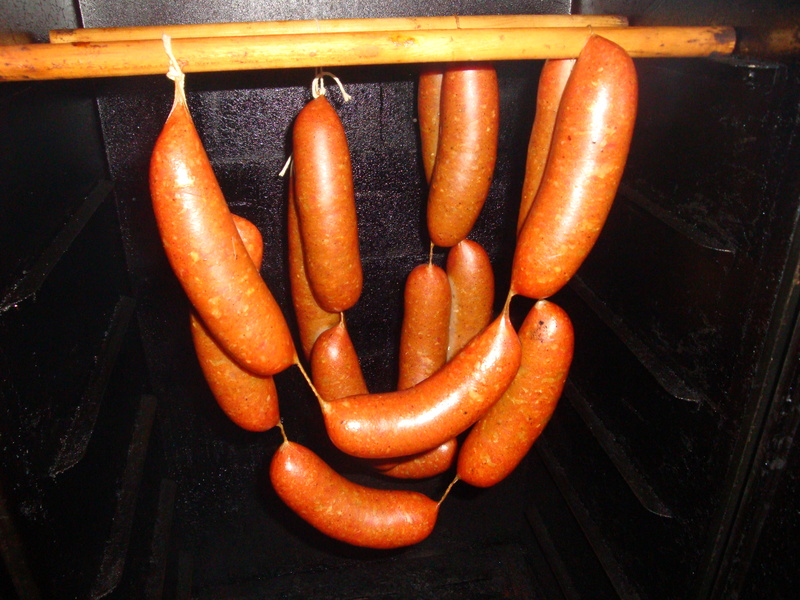 Meanwhile, I break my sausage rope of links into groups of six and allow them to hang in the smoker from a wooden dowel rod that I use to smoke with. 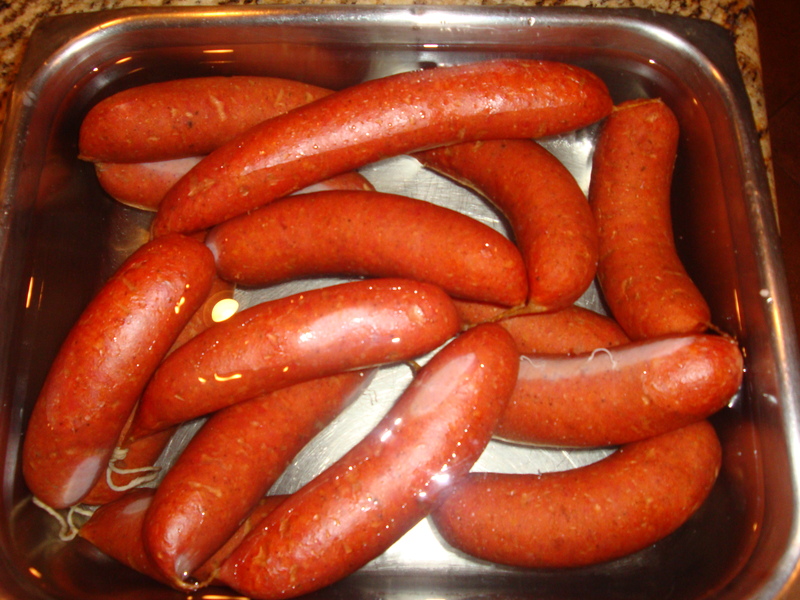 After about 2 ½ to 3 hours the sausages reach an internal temperature of 150 degrees. The next step is equally critical and that is to ice water bath the sausages shortly after removing them from the smoker. If you do not and simply refrigerate the sausages you will be disappointed to find that they have shriveled up into a raisin sausage which doesn’t look too cool. 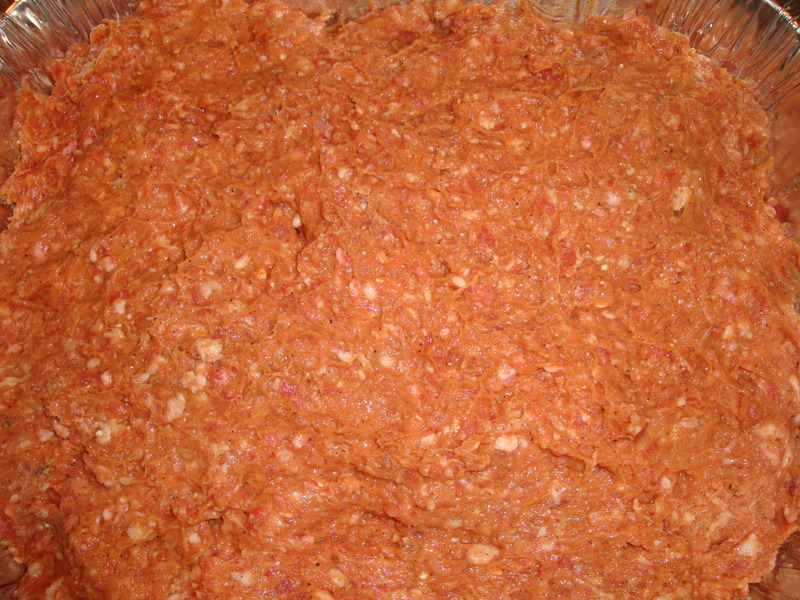 The sausage is fully cooked and can eaten cold if desired. I have since sliced the knackwurst cold onto a meat and cheese platter which was good as well as adding a few to my previously mentioned Choucroute Garnie dish for Thanksgiving (post and photos to follow shortly). These sausages are awesome and can also be poached to temperature in some simmering water, almost how you would heat up hot dogs. I hope you enjoy them as much as I did! Guten Appetit!! !